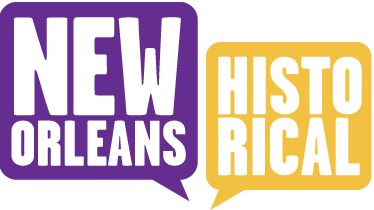 In 1940, the patient population was between 400 and 450 and a massive renovation was underway. The improved hospital created individual rooms for 450 patients and the 13” thick concrete walls made the buildings as fireproof as possible. Fire was always a concern. All of these improvements cost around 4 million dollars. To your right, the two-story buildings with the orange metal awnings are female patients’ dorms. The dormitories are arranged in two quadrangles connected via covered corridors. This provided patients, many in wheelchairs, access to all buildings. Creating a fireproof hospital was a major aim of the last renovation, so even the patients’ room furnishings were metal instead of wood. Every dorm had 30 individual rooms--each with an oscillating fan and radiated heat for winter. Each floor had shared bathrooms and a common parlor. The original design provided men and women with separate dorms. Later on, when patient couples ran away and returned married, they developed a thriving “suburbia” of homemade cottages towards the rear of the facility so that they could live together. A Carville “date” often involved a hot-plate in the woman’s room, a card table across the threshold with the man sitting in the hall. In the 1960s, one of the dormitories was remodeled into apartments to allow for the cohabitation of couples. Each apartment had a private kitchen and bathroom. Dormitory #24 was designated the “Carville Mall,” where free enterprise thrived. A patient could open her own shop to provide goods or services to fellow patients. Some popular patient-run businesses included a radio repair service, a barber shop, a bicycle repair shop, a beauty parlor, a photography shop, and even a dry cleaner's. Hospital Corridors, National Leprosarium. 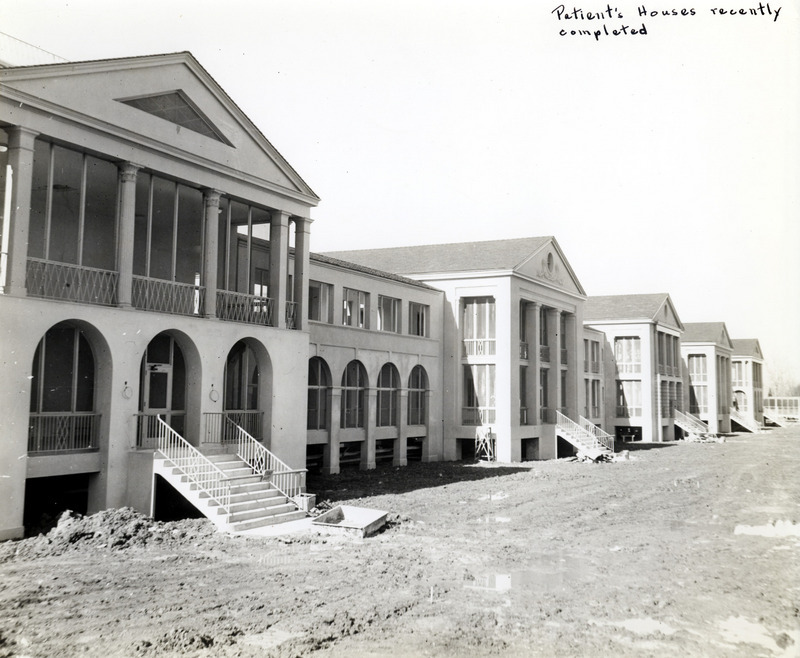 : About 2 1/2 miles of covered walkways, some two stories tall, connected the patients' dormitories, infirmary, cafeteria, recreation center and chapels. ~ Source: Image Courtesy of the National Hansen's Disease Museum, Permanent Collection. Carville, LA. 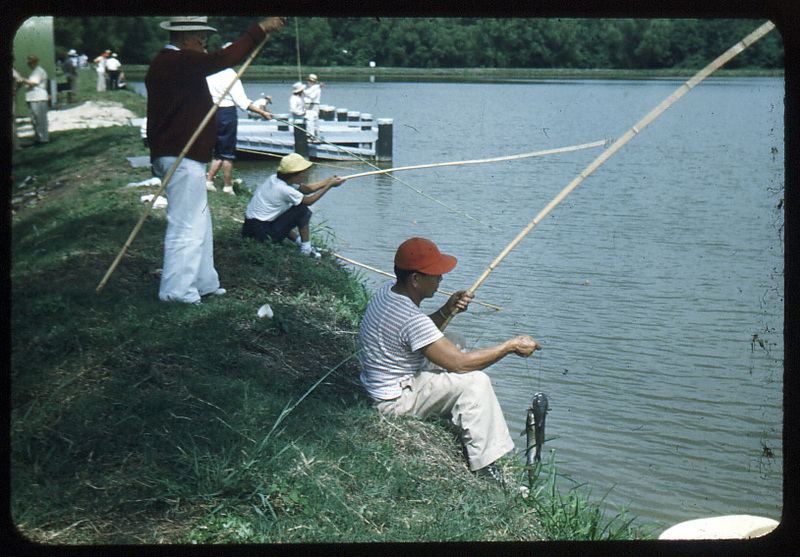 Patients fishing, Lake Johansen, Carville. : Lake Johansen, measuring 20 acres, was dug out of a naturally occurring low area on the 400-acre site in 1950. "The Lake" was designated as a patients-only recreation area. Many "Carville kids" grew up on the staff-side of the hospital in the 1950s-60s. When these Carville kids visit the museum today, they often express a desire to finally get to "The Lake". ~ Source: Image Courtesy of the National Hansen's Disease Museum, Permanent Collection. Carville, LA. Patients' Dormitories, constructed 1940-41. : Each new "house" had individual rooms for 30 patients. Living rooms and bathrooms were shared areas on each floor. Screened porches, front and back, added to air circulation. Air-conditioning didn't become available until the late 1960s. 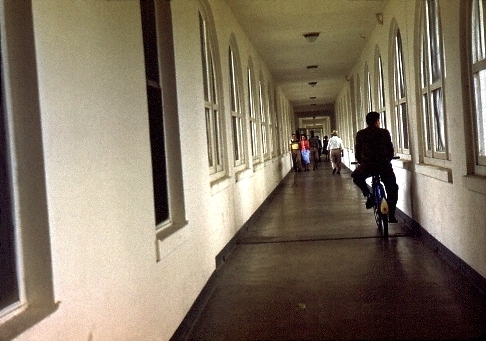 The covered and screened corridors connecting all dorms gave patients, many in wheelchairs, maximum mobility and independence. ~ Source: Image Courtesy of the National Hansen's Disease Museum, Permanent Collection. Carville, LA. 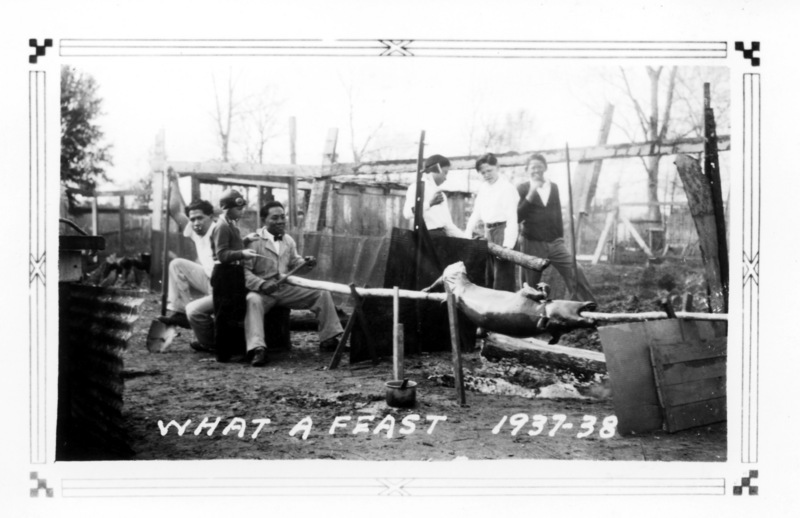 Patients' New Years Feast, 1937-38. ~ Source: Image Courtesy of the National Hansen's Disease Museum, Permanent Collection. Carville, LA. Patients' band, 1930s. 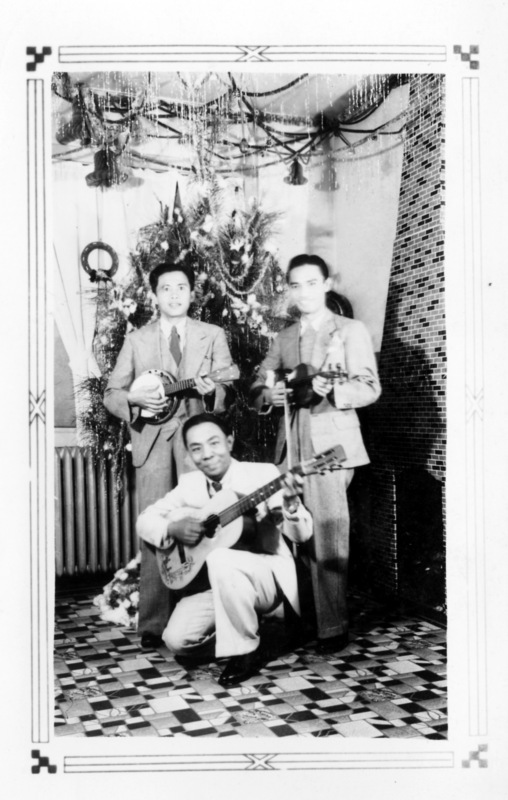 : Many patients formed musical groups which reflected their culture of origin. ~ Source: Image Courtesy of the National Hansen's Disease Museum, Permanent Collection. Carville, LA. Patient enterprises. 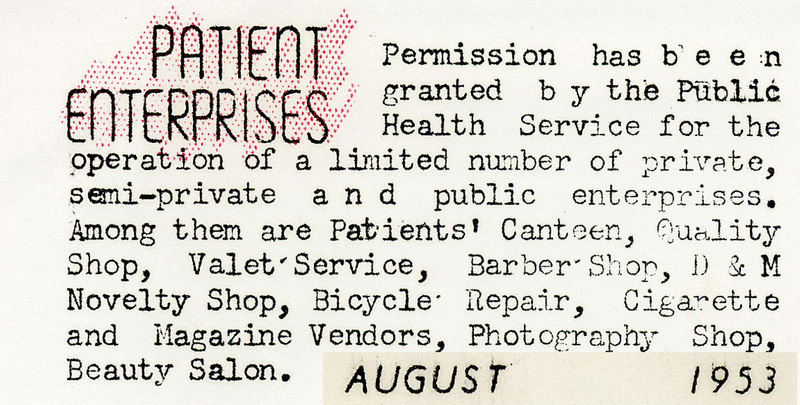 : This snippet from the 1953 Patients' Handbook lists the types of enterprises offered on-site. "House 24" served as the Carville Mall for many years. Patients supplied one another with services that they could not access outside of the hospital. 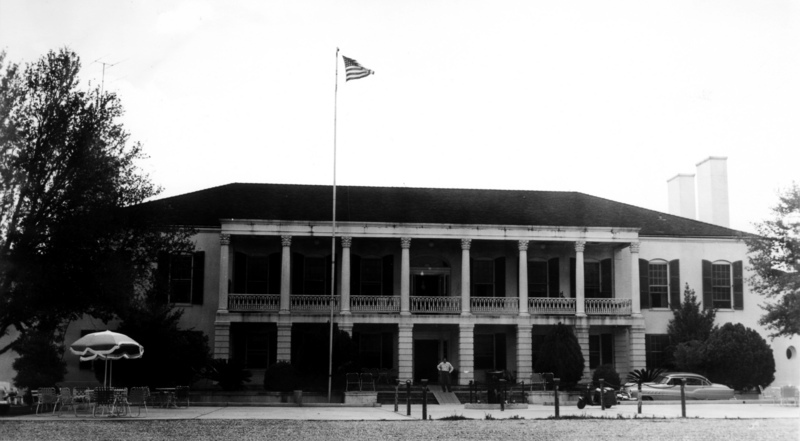 This also allowed many of the long-term quarantined patients to supply income for families outside of the Leprosarium, and pay into social security. ~ Source: Image Courtesy of the National Hansen's Disease Museum, Permanent Collection. Carville, LA. Patients pose in the hospital corridors. : This photograph illustrates the Carville hospital corridors in the 1930s, before the hospital was rebuilt. This corridor's walkway, ceiling and railings are wooden. After 1940, all buildings and walkways were fireproofed using rebar-brick-concrete construction. ~ Source: Image Courtesy of the National Hansen's Disease Museum, Permanent Collection. Carville, LA. 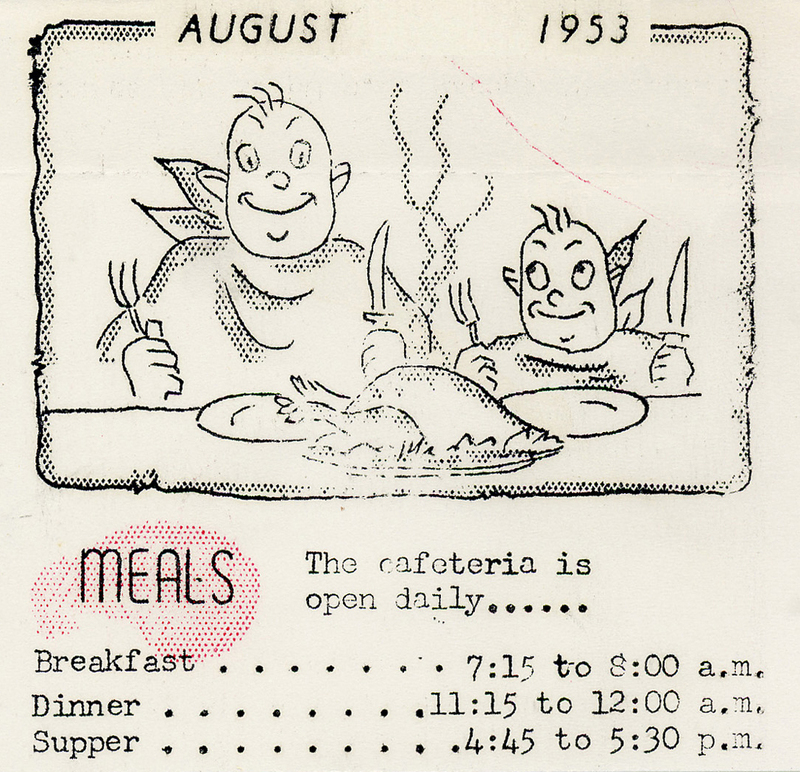 Three meals daily... : This snippet of the 1953 Patient Handbook lists patients' cafeteria hours. In addition, at about 9 p.m. every evening, the night watchman would push a cart with milk and bread, both produced on-site, through the corridors to offer a snack before "lights out." ~ Source: Image Courtesy of the National Hansen's Disease Museum, Permanent Collection. Carville, LA. Clothing allowance. : The federal government offered a yearly clothing allowance to patients. Over the years, outside charitable organizations regularly donated clothing to patients. 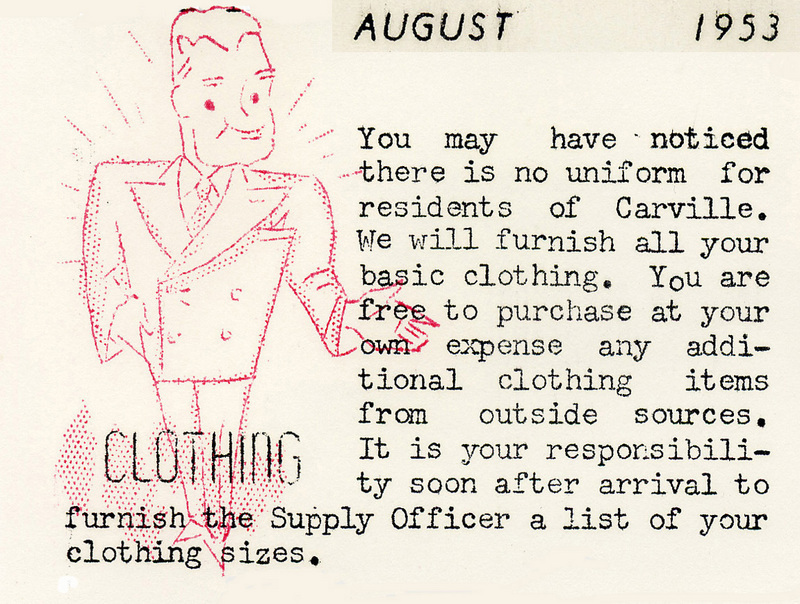 In the canteen, managed by the Patient Federation, patients could place their orders for clothing through catalogs, like Sears, Roebuck and Co. and Montgomery Ward. ~ Source: Image Courtesy of the National Hansen's Disease Museum, Permanent Collection. Carville, LA. 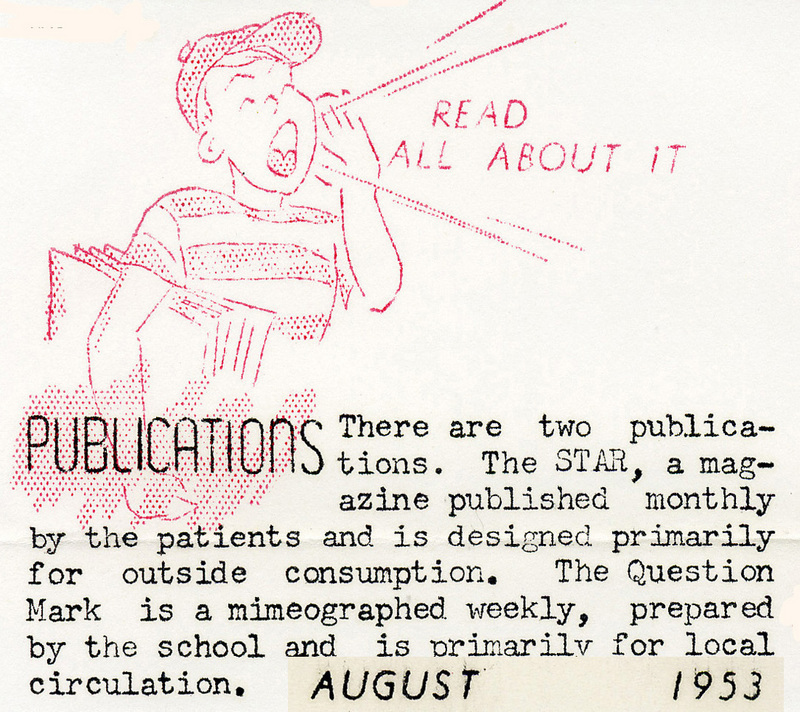 Patient publications : The STAR Magazine began as a mimeographed gossip rag in 1931 and grew into an international watchdog for patient advocacy and the latest information on Hansen's disease research and treatment. In addition, the Question Mark (the patients' school newsletter) and Point Clarian (federal staff newsletter) were published here. The STAR is available online via LOUIS digital libraries. The Point Clarian and Question Mark are available for research through the museum archives. ~ Source: Image Courtesy of the National Hansen's Disease Museum, Permanent Collection. Carville, LA. Patients' Recreation Center, completed 1941. : The Recreation Center contained a library, patients' canteen, activity rooms, a ballroom and a 400-seat theater. This building was the center of a Carville patient's life once they were healthy enough to take part in spontaneous and planned activities. Architectural elements of the building, such as the number and order of columns and its general dimensions, reflect Indian Camp Plantation. ~ Source: Image Courtesy of the National Hansen's Disease Museum, Permanent Collections. 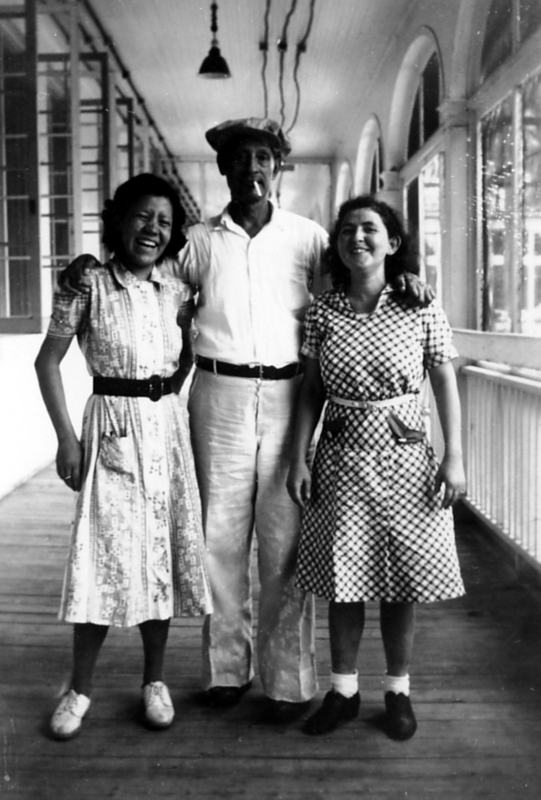 Kyle Hymel; Elizabeth Schexnyder, Curator, National Hansen's Disease Museum, Carville, LA, “Carville, The National Leprosarium: Patient Life,” New Orleans Historical, accessed April 24, 2019, https://neworleanshistorical.org/items/show/636.